Gospel concert at The Finnish Church in London. St. Michel Strings teamed up with Tesar Jazz Band on 27th November 2013 in concert and congress hall Mikaeli in Mikkeli. The theme of the evening was Jazz & Swing Forever – evergreen gems of jazz and swing. The conductor was Krzysztof Dobosiewicz. The band plays mainstream and swing jazz and has many Duke Ellington's tunes in the repertoire. The band leader Krystian Tesarczyk was born in Poland. The last 36 years he has lived in Finland. During the time he has directed several jazz ensembles: jazz singer groups, big bands and jazz combos. Tesar Jazz Band is one them. The band has had the honor to play with many great and well known jazz musicians e.g. Jukka Perko (saxophones),Severi Pyysalo (vibraphone), Ted Curson,USA (trumpet), Jyrki Kangas (contrabass), Markku Johansson (trumpet), Vitali Imereli,Georgia (violin), Jari Perkiömäki (saxophones), Iiro Rantala (piano), Antti Sarpila (clarinet, saxophones), Marian Petrescu, Romania (piano), Raivo Tafenau, Estonia (saxophones), Janusz Muniak, Poland (saxophones), Tomasz Grzegorski, Poland (saxophones), Marcin Slusarczyk, Poland (altosax), Seppo Hovi (piano), Riitta Paakki (piano), Keith Hall, UK (drums), Pentti Lasanen (saxophones), Risto Salmi. 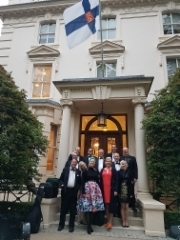 (saxophones), Marzi Nyman (guitar), Riku Niemi (vibraphone), Eero Koivistoinen (saxophones), Tero Saarti (trumpet), Sonja Lumme (vocal), Lenni-Kalle Taipale (piano), Kepa Kettunen (drums), Tiit Kalluste﻿, Estonia (accordion), Manuel Dunkel (tenor saxophone), Seppo Kantonen (piano), Lembit Saarsalu, Estonia (tenor saxophone), Ville Vilén (vocal), ﻿Jaakko Pitkänen ﻿(guitar) and Juho Valjakka, piano.